(Bloomberg) -- European stocks edged lower as falls among basic resources and tech stocks outweighed a rise for banks, after minutes from the U.S. Federal Reserve’s latest policy meeting highlighted concerns around several uncertainties. The benchmark Stoxx Europe 600 index declined 0.1 percent. The U.S. Fed’s minutes also indicated that rates are likely to be kept unchanged in 2019. Luxury goods maker LVMH jumped 3.8 percent after its first-quarter sales beat estimates, while a trading update propelled chocolate maker Barry Callebaut AG 2.1 percent higher. The U.K.’s FTSE 100 index slipped 0.1 percent after Brexit was delayed until the end of October. 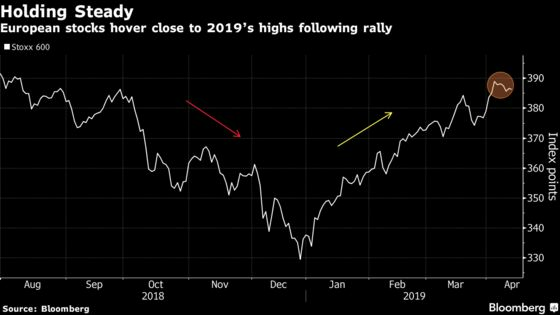 European stocks have rebounded following a tech-led sell-off at the end of last year, with the Stoxx 600 keeping close to this year’s highs amid recent economic data that hasn’t been too encouraging and with the first-quarter earnings season just around the corner. “Over the next few weeks, assuming the business surveys improve and assuming Xi and Trump eventually reach some sort of agreement, I think we will see some further upwards moves in equity prices, credit prices, real estate prices,” Andrew Milligan, head of global strategy at Aberdeen Standard Investments, said in a phone interview, referring to the trade negotiations between the U.S. and China.